Important: April overnight visits are for admitted students only. 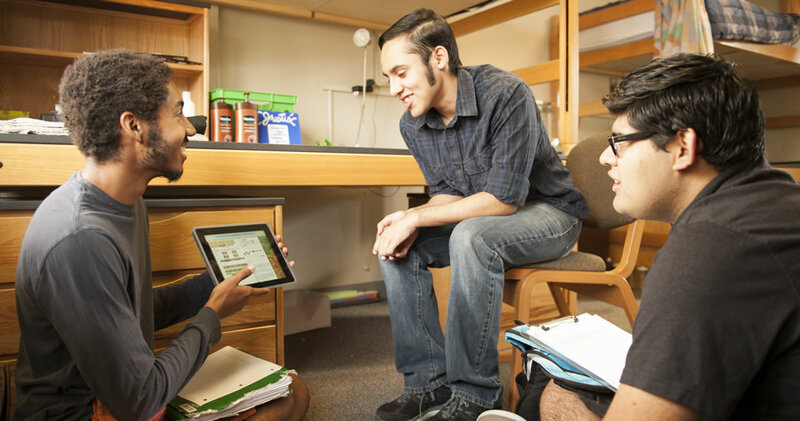 An overnight visit is the best way to experience student life at Harvey Mudd College. We offer overnight visits—Monday through Thursday—in our residence halls from late September until Thanksgiving and throughout February. During your overnight visit, you can take a tour, participate in an interview, eat in our dining hall, sit in on classes, and meet our amazing community! Please read the Checklist below before registering for an overnight visit. Overnight visits are available to high school seniors only. Register for an overnight visit at least two weeks in advance of your visit date. You will need a parent/guardian to complete the HMC Overnight Visit Policy section of registration. Do not book your travel prior to completing registration. Plan/book your travel, including ground transportation, to Harvey Mudd College. All overnight visitors must check in for their overnight visit at the Office of Admission by 4 p.m.
Plan the remainder of your visit. Check the class schedule and decide which classes to sit in on. You may also consider emailing faculty to arrange a brief meeting. Keep in mind you will need to meet your host at the Office of Admission at 11:55 a.m. or 4 p.m., depending on when you arrive to campus and check in for your overnight visit. Check in! We will give you a packet for your overnight visit, which includes contact information for your host, emergency information, a campus map, a course schedule, and meal passes for our Hoch-Shanahan Dining Commons. Enjoy a wonderful and informative visit to Harvey Mudd College! Students must check in with the Office of Admission prior to spending the night on campus. Students may check in after 8 am, but not during the lunch hour (between noon and a 1pm) and no later than 4 pm. Please plan your travel to campus accordingly. We are not able to accommodate late arrivals to the campus. Who will be my host? What dorm will I be staying in? First-year students through seniors volunteer as overnight hosts for visiting students. Dorms are not assigned by year so regardless of your assigned host, other students representing a range of interests and experiences are still easily within reach. It should be noted we do not accommodate requests for hosts of specific class years or dorms. When/How will I meet my host? We have designated 11:55 am and 4 pm as meet-up times for visiting students and hosts at the Office of Admission. If you arrive earlier in the morning or after lunch, we can secure your belongings in our office so you may go on a campus tour, sit in on classes, etc., then return later to the office to connect with your host. Students should expect to sleep in sleeping bags on the floor. Occasionally, hosts are able to offer more comfortable accommodations (a couch, a futon, etc.). Students are allowed to spend one night on campus for an overnight visit. Otherwise, students may leave at their discretion. We only recommend that students make the most of their time on campus by considering a campus tour and information session, an interview, and visits to classes. When should I schedule for a campus tour and/or interview during my visit? We recommend scheduling your campus tour and interview around classes you would like to sit in on. Campus tours and interviews are offered many times a day, while certain classes may only meet once during your overnight visit. Do I need to give advance notice for the classes I would like to sit in on? No. We ask only that you check in for your overnight visit before attending classes. We also suggest arriving early to classes so you may introduce yourself to the professor. Faculty are very welcoming of visiting students and may even point you to other classes if it’s not a great day to observe theirs (like exam days). You will find the current course schedule in Visiting Classes. I am flying into LAX/ONT airport, how do I get to/from campus? We suggest arranging for transportation through Super Shuttle. The service picks up and drops off directly on campus. If possible, we recommend flying into Ontario Airport. It is a nice, low-key airport just 10 miles east of campus. Most current students fly in and out of Ontario Airport and use Super Shuttle for ground transportation.